NetEnt is getting ready for trick or treat season with the launch of horror-themed Halloween Jack. NetEnt also releases Wild Bazaar, a Middle eastern and mystical follow up to global proven performer: Fruit Shop. Set to send shivers down the spine, NetEnt’s spooky slot Halloween Jack tells the story of a cursed jewellery box that forces its owner into unspeakably scary acts. Great evil is unleashed in the 5-reel, 3-row, 20-bet line video slot with terrifying features including free spins and Jack ‘o’ lector, as well as the walking wild, stacked hell hound wild and expanding grim reaper wild. 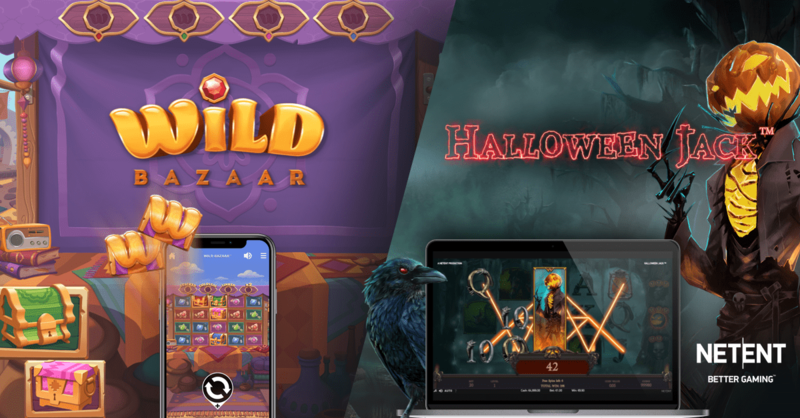 NetEnt is further underlining its creativity and the diversity of its games catalogue this month with Wild Bazaar joining Halloween Jack in an exciting, same day double release. Wild Bazaar is based on the top performing game Fruit Shop’s proven math – with some major differences. A little Middle Eastern Spice has been added both the theme and the players’ ride through newly added features in Wild Bazaar. Wild Bazaar transports players to a magnificent, magical marketplace and takes them on a wild spin adventure as they search for hidden treasures among the scent of spices, vibrant fabrics and curios to launch features simultaneously for those big wins. “Fruit Shop is a top game in our huge network and we have taken it to the next level with Wild Bazaar. We are delivering on proven performance to our operators and our players get that trusted NetEnt experience, familiar game feel, but with some extra pay out potential in a buzzing and hectic Middle eastern setting”, says Bryan Upton.